A few days back, I had shared my compilation of analysis of packaged foods to a few mothers, who then circulated it among other friend groups. 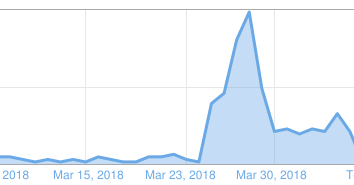 The visits to my blog increased 10X in the past 2 weeks. There were many comments and messages too, mostly encouraging and supportive. 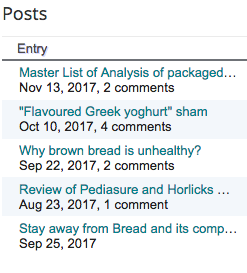 As I wrote in this post, I like to analyse my blog statistics on a daily basis, to understand which articles are most popular. Although the sample size is small, this gives an indication on the popular foods that urban Indians perceive to be “healthy”. Greek yoghurt has become extremely popular in urban Indian cities, primarily because of the “high protein” hype. Although the plain/natural greek yoghurt seems okay in terms of its ingredients, the flavoured ones are loaded with sugar, artificial colours and flavours. Personally, I don’t consume loads of milk and milk-based products. I’m not a vegan yet and I do have my 2 cups of chai and my curd rice. But I don’t believe in the nutrition promise (protein,calcium, fats etc) of dairy products. More intake of dairy causes a lot of health issues, ranging from diabetes, obesity, hormonal imbalances, PCOD etc. I prefer to choose plant-based sources for my protein and calcium needs. Brown bread has also become a regular staple in many urban households. As I wrote in my earlier post, brown bread also contains maida (refined wheat flour). Other chemicals such as improvers, emulsifiers, acidity regulators etc are also added to extend the shelf life of packaged breads. One of my blog readers had asked me to show a comparison between different types of bread. 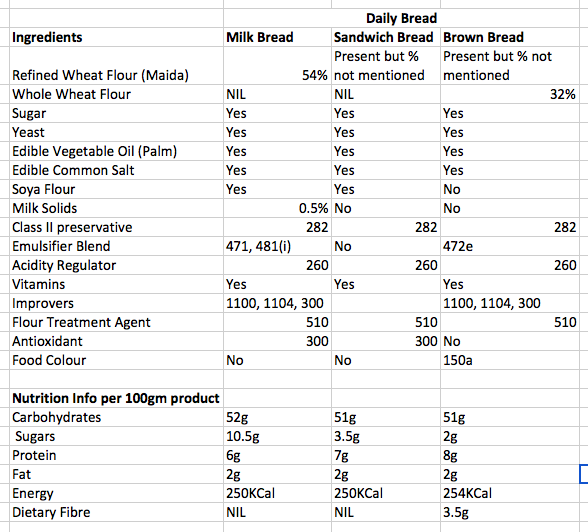 Here’s a quick comparison of the ingredients between milk bread, sandwich bread and brown bread. As you can see, except for the 32% whole wheat flour, rest of the ingredients are pretty much the same - improvers, preservatives, flour treatment agents, emulsifiers etc. And of course, it contains caramel that actually gives the “brown” colour to brown bread. In terms of nutrition information, the calories, carbohydrates, protein, fats etc are same across all 3 varieties. In the case of brown bread, there is a mention of dietary fibre (3.5g per 100 gm). 100 gm would be around 4-5 slices of bread. So if you are eating a sandwich(2 slices) for a meal, then the fibre intake would be less than 2g, which is extremely low. Adding a few veggies like lettuce, cucumber and tomato might increase fibre but definitely not adequate for a meal. Recommended total fibre intake is 25 - 30 gm per day. If a packaged food is being promoted as "healthy", as consumers, it is our responsibility to question and figure out the truth, instead of blindly believing the celebrities, tall claims, attractive packaging, relatable ad story, recommendations from social media influencers and food bloggers. Why green tea is NOT a miracle drink?